Click on the above "Angels Of Light Gifts"
Logo to go to my online store . My gift began at the age of 3 years old. I can still remember seeing my Angels. They were always around me guiding me, keeping me out of trouble. Never afraid of my Angels, I felt a deep sense of comfort from them. The Angels filled me with their love, comfort, and compassion. Growing up, some children have imaginary friends. Guarding this truth is as much a responsibility as it is a gift. As I grew into a man I was no longer satisfied with the Religion I had been raised with, but wanted to explore other Religious Thoughts. I began with Buddhism and then expanded into Hinduism, Catholicism and more. My Religious journeys path finally led me to Spiritualism. I found various truths in all the Religions I studied, and discovered they all mixed very well into Spiritualism. This has helped form me into the person that I have become today, as well as in my Ministry as an Ordained Spiritualist Minister since 1998 in Wells, Kansas at: Sunset Spiritualist Church & Spiritualist Camp. ​I have been doing Professional Readings and Counseling since 1982, at the age of 14. I have been offering my Angelic and Spiritual Counseling and Reading for the past 36 years. I am also both a Certified Spiritual Medium & Psychic since 1997 & Certified Spiritual Healer since 1997 thru Psychic Society International. Today I use my gifts as an Angel Ambassador. 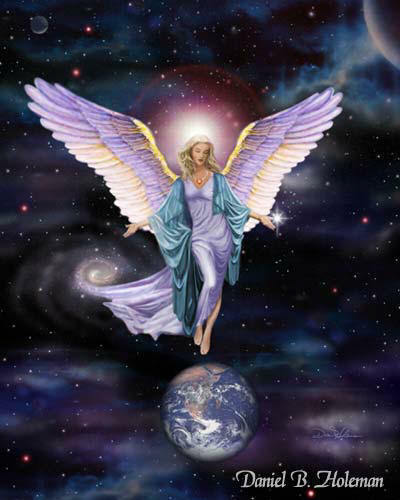 I listen to their divine wisdom and guide my clients to them as they too can receive their Angelic Connection. Through the Angels Guidance, I teach how to transform past negative experience into motivating future growth. Through their eyes, all experience serves to move forward while filling us with peace, harmony and closure in all things past, present and to come. Meeting Your Guardian Angels workshops & Parties. Past Life Regression & Past Life Readings. Paranormal House Investigations & Home Blessings/Cleansings. ​I work with clients from all over the world.